She was the first of her kind. But Mia Hopkins’ journey has just begun. It’s been a journey that has seen the rigors of Division 1 women’s basketball. But it’s also been a journey that has led the former Patriot to realize her dreams. Hopkins graduated from Pittston Area in 2012 and has already made an impact on the Monmouth University women’s basketball team. Mia became the first Division I scholarship player from Pittston Area girls basketball. She scored over 1,500 points and grabbed more than 1,000 rebounds in her high school varsity career. While at Pittston Area, she averaged 20 points per game, 14 rebounds, 5 assists, 4 steals and 3 blocks. Those numbers got her on the right track to a Division 1 school. The 5-10 guard is now playing at the Division 1 level. And with that comes the rigors of playing at college basketball’s upper echelon of competitiveness. Playing at the Division 1 level is like nothing else, Hopkins said. Her first full taste of that came when the Hawks played perennial powerhouse No. 1-ranked Connecticut in late November. Hopkins played 14 minutes in a game Monmouth lost 100-46. During another tournament earlier in the season, Hopkins had a chance to meet and talk with legendary Connecticut coach Geno Auriemma. Through 16 games, Hopkins is averaging around 10 minutes per game, and 2.5 points. She played a season-high 19 minutes against Rider on Jan. 5. 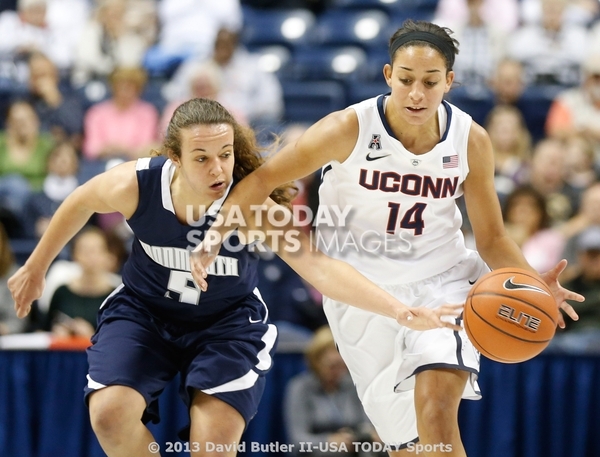 She is shooting 42 percent from the field and is averaging close to three rebounds per contest. Monmouth picked up its second win in its last three games on Friday - a 64-56 win over Canisius. That moves the Hawks to 2-3 in the Mid-Atlantic Athletic Conference (MAAC) and 3-13 overall. Both conference wins have came in the last week of play. The Hawks beat Fairfield on Jan. 3. for their second win of the season, and first in MAAC play. “We’ve been practicing a lot lately,” Hopkins said. “We literally had no winter break at all. That was tough for Hopkins. But with a young team, sometimes that’s the best medicine after a rocky start to the season. Monmouth is young, and frankly, they are tired of losing. 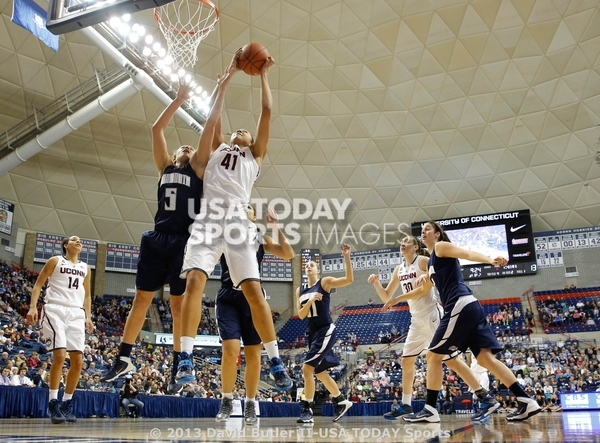 Mia posted one of her best outings in her first Division 1 game, against Yale. The Hawks took a loss, but Hopkins pulled down nine rebounds and poured in seven points. In the Hawks’ first win of the season, Hopkins shined again. Monmouth opened the 2013-14 campaign with seven-straight losses before beating Maryland-Eastern Shore. That was another big game thus far as a freshman. In 14 minutes, Mia scored eight points on 4-of-6 shooting. She also handed out four assists. Connecticut was Monmouth’s only ranked opponent it has played thus far this season. But it was a big one. Mia has always had that big-game mentality. While at Pittston Area, she showed the ability to post a huge game, scoring 39 points as a junior against Holy Redeemer, while also pulling down 29 rebounds in her first game as a freshman. But it doesn’t come as easily when playing against the best student-athletes in the country. Hopkins went on to add it’s like going from the fastest and strongest player to now everyone is just as fast, and just as strong. Hopkins in the daughter of Sharon Hopkins, Pittston. In four years, the first-year Hawk hopes her career in basketball isn’t over. Even when she graduates, she hopes to play ball somewhere. When she finally does give up playing competitively, she’ll still be in the game. She said she’s like to become a basketball or strength and conditioning coach. Monmouth University is located in West Long Branch, N.J., which is about an hour from New York City and Philadelphia. Freshman Mia Hopkins is starting to make an impact with the Monmouth University women’s basketball team. Hopkins (Pittston Area) has played in all 23 games off the bench but recently has come on strong – 13 points in 17 minutes in a 64-49 victory over Siena, 13 points and four rebounds in 11 minutes in a 75-70 victory over Manhattan, and 12 points and seven rebounds in 21 minutes in 52-41 triumph over St. Peter’s. But the coach believes that Hopkins has adjusted well, especially of late. The 5-foot-10 Hopkins is averaging 4.5 points and 3.0 rebounds, and has hit 44 of 95 shots from the field (.463). She also has 18 assists and nine steals for the Hawks, who are 6-17 overall but they’re still in the wide-open Metro Atlantic Athletic Conference race with a 6-7 record. WEST LONG BRANCH, N.J. – Monmouth University freshman guard Mia Hopkins (Pittston, Pa./Pittston Area) has been named MAAC Rookie of the Week, the league office today announced. Hopkins becomes the second Hawk freshman to earn the honor this year, joining Helena Kurt (Spanga, Sweden/Igelstavikens Gymnasium), who was recognized on Nov. 25. Hopkins continues to emerge as a valuable contributor for the Hawks, as evidenced by her 9.5 points and 5.0 rebounds per game this week. She had six points, six rebounds and two assists against Iona on Friday, before matching her season high with 13 points (5-8 FG, 3-4 3-pt. FG) on Sunday against Manhattan. 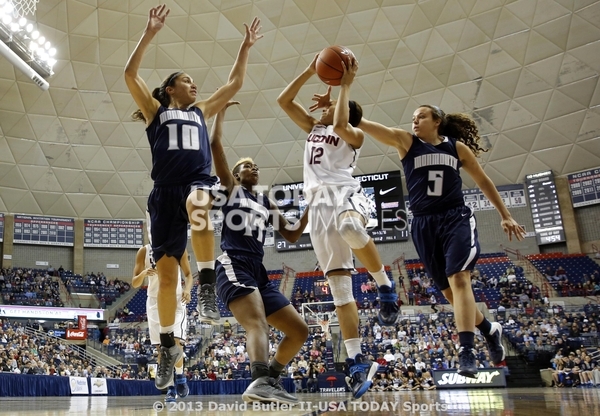 She also added four rebounds, two steals, a block and an assist against the Jaspers. She shot 42.1 percent (8-19) from the floor, including 42.9 percent (3-7) from long range on the week. The Hawks return to action Thursday, when they take on Hourglass Rival Saint Peter’s. Opening tip is scheduled for 5 p.m. at the Yanitelli Center. Mia Hopkins continues to emerge as a valuable contributor for the Hawks, as evidenced by her 9.5 points and 5.0 rebounds per game this week. She recorded six points, six rebounds and two assists against Iona on Friday, before matching her season high with 13 points on Sunday against Manhattan. Hopkins also added four rebounds, two steals, a block and an assist against the Jaspers. She shot 42.1 percent (8-19) from the floor, including 42.9 percent (3-7) from long range. Monmouth University freshman and Pittston Area graduate Mia Hopkins has been named Mid-Atlantic Athletic Conference Rookie of the Week, the league office recently announced. Hopkins became the second Hawk freshman to earn the honor this year, joining Helena Kurt, who was recognized on Nov. 25. Hopkins continues to emerge as a valuable contributor for the Hawks, as evidenced by her 9.5 points and 5.0 rebounds per game this week. She had six points, six rebounds and two assists against Iona on Friday, before matching her season high with 13 points (5-8 FG, 3-4 3-pt. FG) on Sunday against Manhattan. 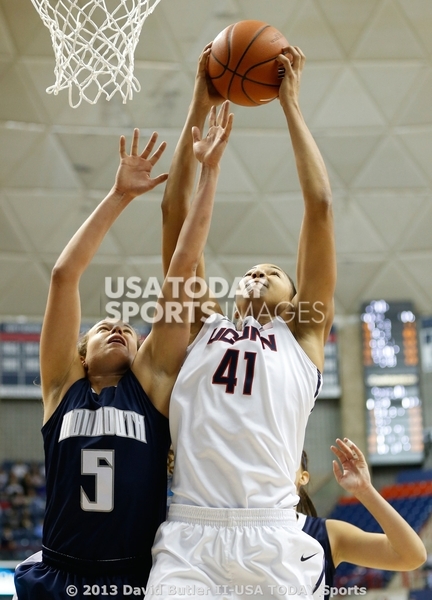 She also added four rebounds, two steals, a block and an assist against the Jaspers. She shot 42.1 percent (8-19) from the floor, including 42.9 percent (3-7) from long range on the week. FRESHMAN (2013-14): Saw action in all 33 games off the bench, averaging 4.9 points and 2.9 rebounds per game… Hit on a team-best 35.3 percent of her three-point attempts… Shot 44.8 percent from the floor… Scored a season-high 15 points on 4-of-8 shooting from the floor and 5-for-6 from the free-throw line against Siena (Mar. 2)… Established an early season high of 13 points at Siena (Jan. 13) on 6-of-8 shooting, including a conversion on her only three-point attempt… Matched her then-season high with 13 points in a win against Manhattan (Jan. 26), connecting on 5-of-8 field-goal attempts, including 3-for-4 from long range… Chipped in with 12 points and seven rebounds in a victory over Saint Peter’s (Jan. 30)… Opened her career with seven points and a season-high nine rebounds, including five on the offensive glass, vs. Yale… Had a strong all-around performance in the Hawks’ first win of the season vs. UMES, compiling eight points, five rebounds and a season-high four assists… Made a season-high three steals at Niagara (Jan. 19). BEFORE MONMOUTH: Became the first Division I scholarship player from Pittston Area High School in Pennsylvania… Scored over 1,500 points and grabbed more than 1,000 rebounds in her high school varsity career… Named to the Pennsylvania Sportswriters All-State Team in both her junior and senior years… Nominated for McDonald’s All-America as a senior… Played in the Pennsylvania State All-Star Game in Harrisburg in the postseason… Averaged 20.3 points, 14.0 rebounds, 5.0 assists, 4.0 steals and 3.0 blocks per game as a junior, helping Pittston Area to a 17-7 record, including 12 straight wins to begin the season… Named the Wyoming Valley Conference Player of the Year and led the Patriots to the Division 2 playoffs as a junior... Showed the ability to post a huge game in high school, scoring 39 points as a junior against Holy Redeemer, while also pulling down 29 rebounds in her first game as a freshman… Hopkins also played AAU ball for Coach Isiah Walker with the Firm AC basketball program. PERSONAL: Born in Pittston, Pa. … The daughter of Sharon Hopkins… Hopes to become a basketball or strength and conditioning coach after college… Undecided on a major. She has the drive. She has the determination. And she’s making every opportunity count. Mia Hopkins, a 2013 Pittston Area graduate and the only Patriot girls basketball player to ever receive an NCAA Division 1 basketball scholarship, is currently a key factor in the Monmouth University women’s basketball team. And she still has two years left. Hopkins, a sophomore guard for the Hawks, has taken every opportunity and turned it into an impressive start to her career. Through the first half of the season, averaging 13 minutes of playing time, Hopkins is scoring just under 6 points and averaging 4 rebounds per game. Off the bench, she is just one of six Monmouth players to see the floor in every game this season. Of those six players, Hopkins is shooting a team-best 40 percent from the field. While she doesn’t see the floor as much as some of her teammates, Hopkins is showing that she can play with the best of Division 1 players. Being a part of the team her freshman season made that happen. When the calendar was ready to flip to 2015, Hopkins began to turn it on. In 30 minutes of action against University of Maryland Eastern Shore on Dec. 30, Hopkins poured in a career-high 21 points. She was 9-of-13 from the field. In her next game, Hopkins rattled off another 14 points in a loss to Iona College. She made four threes. She filled in for an injured teammate and took advantage. Monmouth head coach Jenny Palmeteer saw that drive and determination while scouting Hopkins while she was at Pittston Area. Hopkins has a nose for the basketball, on the offensive end and defensive end. She’s able to get up and down the floor quickly and create matchup problems for opposing teams. That passion started at a very young age. Hopkins has been around the game as far back as she can remember. She has pictures of herself carrying a basketball around her home. She even remembers the first time she made a basket in her driveway. Over the course of the rest of the season, and through the next two years, Hopkins wants to use that passion to help her get to the next level of her college career. Monmouth is sitting at 8-11 overall and 4-6 in the Middle Atlantic Athletic Conference (MAAC). The Hawks, however, seem to be catching some momentum. In their last game, which Hopkins wasn’t able to get into the score sheet in her 10 minutes of play, the Hawks held Fairfield University to 33 points. The 33 points were the fewest allowed by the Hawks in nearly five years. Hopkins is a force on the defensive end, according to Palmateer. Her rebounding is a big reason why. Hopkins contributes that to her aggressiveness. As a freshman for the Hawks, Hopkins saw considerable minutes in all 33 games off the bench. Last season, she averaged just shy of 5 points and 3 rebounds per game. She shot a team-best 35 percent from the three-point line and an impressive 45 percent from the field overall. Hopkins scored a then-career high 15 points in a game against Siena College last March. Although her numbers seem to be very similiar to last year’s statistics, both Hopkins and Palmeteer see improvement. Prior to selecting Monmouth to continue her hoops career, Hopkins turned in an impressive resume at Pittston Area. There, she became the first Division 1 scholarship player from the high school. She recorded over 1,500 points and grabbed more than 1,000 rebounds in her varsity career. She was named a Pennsylvania Sportswriters All-State selection her junior and senior years, and was nominated as a McDonald’s All-American as a senior. Her junior year was most impressive. In 2012, she averaged 20 points, 14 rebounds, 5 assists, 4 steals and 3 blocks per game.